NCL America, Norwegian Cruise Line’s American brand operates a single ship, the Pride of America, exclusively on inter-island cruises. The brand was created in 2005 to provide 7-day cruises that start in Honolulu and visit Nawiliwili, Kauai; Kahului, Maui; Hilo, Hawaii; and Kona, Hawaii. To this day, the Pride of America is the only ship offering 7-day cruises in Hawaii without a foreign port of call, a large competitive advantage over other cruise lines that begin voyages in California and include Mexico in the itinerary. For travelers with only a short time in Hawaii, the inter-island cruise is perhaps the best way to be exposed to all of the state’s major islands. Not only will tourists be able to travel by night and sightsee by day, they will also be able to experience the extraordinary food, delectable food, and exquisite pampering the cruise ship passengers have come to expect. 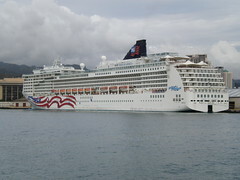 The cruise line also operates several shore excursions while in port. These trips, while sometimes a bit pricey, are pre-planned half- or day-long journeys throughout the island’ spectacular sights and attractions. Travelers who go on an excursion in each port will surely get a flavor of all Hawaii has to offer.